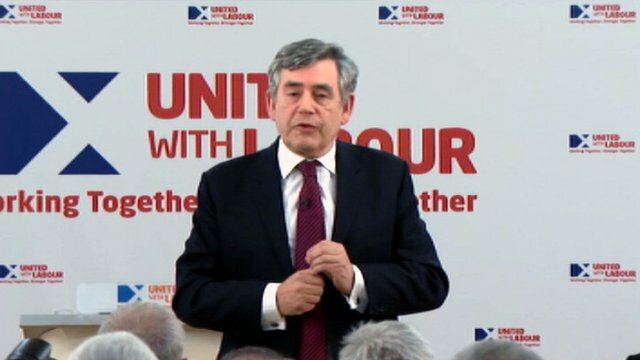 Former Prime Minister Gordon Brown spoke this evening in the House of Commons and warned that Tory opportunism in the aftermath of the referendum poses an existential threat to the United Kingdom. I have asked for this debate on our constitution because in the run up to the election when health, the economy and national security are preeminent considerations, it is doubtful whether there is any other way in the next two months that the House can give detailed consideration to a set of constitutional challenges which, if not thought through and if mishandled will, in time, threaten the very existence of the United Kingdom. I am not here as an advocate for the status quo. I start by recognising that this House of Commons is England’s Parliament as well as the UK’s Parliament and that we should agree a Commons Committee reform that allows for detailed debate on English-only measures by only English members. With the reform of the Lords, reform of regional and local government, reform of the voting system and reform of the Commons itself also part of the queue of complex and inter-connected constitutional issues in need of democratic resolution, some kind of convention or, if rejected, Speakers’ conference is now the best way of ascertaining whether the United Kingdom can finally move from having a 19th century analogue age constitution to a 21st century digital age one. But if the Union is to survive it will have to be built on the interdependence of our four nations and guarantee their equality of status within the UK. The Conservative Party have got it wrong because they presume that the fundamental anomaly in the British constitution is that Scottish MPs can vote on English-only laws whereas English MPs cannot vote on Scottish-only laws and so in retaliation for what they see as Scots pursuing a Scottish interest, they wish to pursue and enshrine an English interest above any common UK interest that could bind us together. But what is called the West Lothian Question is in truth only a symptom of the problem. The central anomaly – and the real asymmetry from which all else follows – is the basic unchangeable imbalance in the size of the four nations. England represents 84 per cent of the population of the UK, Scotland 8 per cent, Wales 5 per cent and Northern Ireland 3 per cent. And England sends 533 members to Parliament compared to 59 from Scotland, 40 from Wales and 18 from Northern Ireland – 117 members in total. It is obvious when you start from such a profound imbalance and asymmetry – such a huge inequality in population and voting shares – a fairness of outcome cannot easily be secured by a blanket uniformity which treats the minorities exactly the same as the majority. It follows that the rules needed to respect and reassure the minorities, who can always be outvoted, have to be different from the rules needed to uphold the majority. This is not a challenge unique to Britain. The United States, Australia, Spain, Switzerland, South Africa, Mexico, Brazil, Nigeria and many other countries have had to find ways of managing the gross inequalities in the size of their constituent parts. So as the price for keeping the United States together, California accepts that it has just two members of the US Senate to represent 38 million of its citizens, while Wyoming has the same number – two senators – to represent just 500,000 people. That’s one senator for 250,000 people compared with one senator for 19 million people. Similarly the price New South Wales pays for Australian unity is one Senator for every 580,000 people, in contrast to Tasmania’s one Senator for every 40,000. And nor is fair treatment for minorities or national unity achieved in the Spanish Senate, the Swiss Council of States, the South African National Council of Provinces and the Brazilian, Nigerian and Mexican Senates by the crude and blanket uniformity of the EVEL approach, but through special arrangements that recognize minority rights have to be respected to hold states, regions or provinces together in one union. But with the Leader of the House’s announcement that he would exclude Scottish representatives from voting on what he calls consent motions, including annual consent motions on tax issues arising from the Budget, he is breaking with the well established practice of other countries, breaking with our own constitutional history and breaking with all sensible advice in creating what he now boasts is an English veto – making ours the first parliament in the world where two classes of representatives exist and where some representatives are more equal than others. By their own insistence on devolving all of income tax to the Scottish Parliament and then using that as a pretext for banning Scottish MPs from voting on consent motions, there will be a constant nationalist refrain that there are now first-class English MPs and second-class Scottish MPs, the English who rule and the Scots there on sufferance. I have to ask members opposite: can you imagine Scotland or possibly Wales and Northern Ireland being enthusiastic about sending its MPs to Westminster indefinitely if they have to withdraw when the real vote – the consent motion or what I would call the veto motion – is being taken on the central economic legislation of every year, on income tax rates in the Budget? Can you sustain truly positive support for one Parliament for long when it is clear that the Government of the day owes its existence to an English majority that rides roughshod over the Scottish representatives? It was said of the Habsburg Monarchy that they would never learn from their mistakes. Surely the Conservatives and Liberal Democrats should heed the lessons of history. It seems that a problem others could not solve in two centuries the Prime Minister now claims he has mastered and resolved in just a few weeks. And so if the Union fell now it will not be because of what happened during the referendum, the result of which was conclusive, but because of what has happened since. It will not be because most Scots demanded independence from the UK – they did not – but because leaders here have failed to convince them that they were fully committed to its unity. It will not be because a majority of people now want to leave the UK but because people feel there is a Scottish interest and an English interest but not a UK interest. The Prime Minister’s cabinet colleague, the Chief Secretary, was blunter about the Prime Minister’s 7 am speech: “[That morning] he went from being a Prime Minister who had absolutely done the right thing in the national interest to making a very partisan judgement on behalf of the Conservative party” – putting, as he implies, the integrity of the United Kingdom second not primarily to any expressed demands of the people of England, but to the very vocal demands of UKIP. I have said nothing yet about the obvious technical problems of EVEL: that it is difficult and complex to define what an England-only or England and Wales-only Bill actually is; that if we take one possible definition – that each must have a “separate and distinct effect” – this might have encompassed just half a dozen bills in a dozen years, which makes us ask why EVEL is being pursued; and that English MPs as a bloc vote differently from UK MPs as a bloc on very few occasions, again suggesting that this is being pursued for other motives. But the truth is these practical considerations matter less because the real damage from EVEL is not from its mechanical application – the real damage will instead have been done before a vote has been cast, in cementing a perception that the UK is only about separate interests and not about a common interest. There is a myth that the Union can survive this new polarisation between Scotland and England because it is held together by bonds that are so longstanding that they can overcome any local difficulty. But what may have been true in the aftermath of the shared sacrifice of two world wars has given way to a new world where none of our ancient institutions are strong enough or popular enough on their own to hold us together. And the Union cannot survive on mutual respect alone, although that too is in short supply at the moment. It will also not survive solely on the basis of a mutual toleration of each other – a minimalist policy of holding each other at a distance for fear we will fight. The Union will hold together only if there are things that the people of our four nations believe they have in common: only if we emphasise that there are common needs, mutual interests and similar values that make us want to cooperate – in short, a belief we do best by sharing. In the modern world, where countries survive or falter only on the basis of what is, in effect, a daily referendum, such sharing has to preserve our historic willingness to transfer risks and resources between each other, to tackle poverty, unemployment and inequality. The Eighteenth Century Prime Minister Lord North is today remembered only for one thing – that he lost America. Can this present Prime Minister now act to ensure that he will not be remembered in history as the Lord North of the Twenty First Century – who, on September 19th 2014 for purely short-term gain, putting party over country and without considering our long term interests as a united country, lit the fuse that eventually blew the Union apart? I have made proposals for reform, not pre-empting a constitutional review, short of excluding Scottish MPs from decisive votes. I know the Secretary of State for Scotland supports me. The issue tonight is can we persuade his colleagues in the Coalition Government before it is too late. Is Nationalism is the route of all EVEL. Sorry couldn’t resist – its the sub editor in me. All nationalism is evil, except for “British nationalism”. « What is Nationalism for?